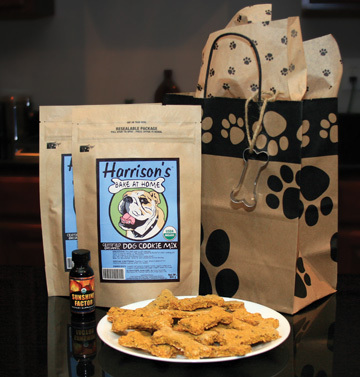 Over the years we have recieved many calls from bird owners who have noticed that their pet bird had developed an interest in “feeding” the family dog, from the cage using Harrison’s Bird Foods. Birds are clever and most dogs will pounce on a tasty bird food nugget given the opportunity. It was these stories that lead to the creation of our premium, certified organic, “Bake at Home” cookie mix for dogs (Harrison’s Certified Organic Dog Cookie Mix). Made from some of the same great certified organic Harrison’s ingredients that you have known and trusted for decades is a tasty treat that you can bake up yourself. It is perfect vehicle for administering medications, or you can customize the cookie as you see fit. We recommend using Sunshine Factor instead of standard cooking oil – which is an added health benefit for your canine pal. The mix is available in 400g bags or can be purchased as “Dog Cookie Kit” which features two 400g bags, one 1oz Sunshine Factor and a fun bone-shaped cookie cutter, all packed into a cool paw-print craft bag. If you have a dog-loving friend the kit makes a perfect gift for any occasion!